Here at Legionella Control International, we pride ourselves on being at the technological forefront in the fight against legionella. Through our teams of legionella specialists we are able to supply the most innovative and technically advanced products available on the market today, one of which is our LegionellaFast, a unique rapid self-test for legionella. Our innovative LegionellaFast is an immediate, on-site self-test developed to give a simple yes:no result for legionella. The simple test can be used anywhere, without the need for specialist expertise or equipment to carry out or interpret the test and its results. 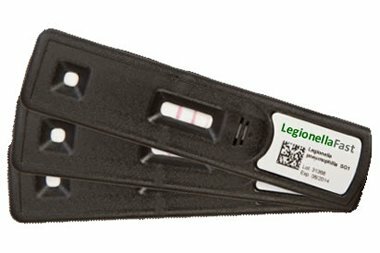 Providing accurate on-site results in just 25 minutes, LegionellaFast is the fastest on-site testing method currently available. Legionella Control International’s rapid legionella test “LegionellaFast” gives accurate on-site results in just 25 minutes, and is the fastest on-site legionella testing method commercially available on the market today. LegionellaFast detects the presence of Legionella pneumophila serogroup 1 using an LFICA (Lateral Flow Immunochromatographic Assay). Serogroup 1 is responsible for over 90% of all cases of Legionnaires’ disease. If the water sample tested contains antigens from Legionella pneumophila serogroup 1, the ‘test line’ on the test paddle will change colour, turning red. The test paddle also uses a ‘control line’ which turns red to confirm the test has been performed correctly. LegionellaFast is not a replacement for routine laboratory analysis, but is an important and very effective way to support your existing legionella risk management procedures. Use to test in areas that don’t have easy access to a suitable lab. There are many buildings that have critical water supplies and are located in extremely remote locations or do not have sufficiently easy access to suitable laboratory testing facilities. On-site testing with LegionellaFast requires no laboratory and can provide a rapid result and valuable reassurance in just 25 minutes. Once legionella has been identified and the contaminated water systems suitably treated and disinfected, LegionellaFast can be used to confirm whether the water treatment has been effective. This may allow any quarantined areas of a building or facility to be brought back in to service far more quickly. Sometimes water systems can go out of specification leading to increased risk, for example the thermal control programme may fail, i.e. cold water is not cold enough, or hot water is not hot enough. Using LegionellaFast can provide an almost instantaneous reading as to whether treatment will be required to contain any risks. It is good practice to regularly monitor water systems. Using LegionellaFast enables water system operators to regularly self-test water systems and identify any potential legionella contamination quickly. This allows operators to take corrective action quickly and so minimise the risks associated with legionella. If you would like further information about our LegionellaFast, rapid self-test kits or any of our other legionella aids to compliance and risk management services, please contact us on 0161 877 0586 (Manchester) or 0203 693 3930 (London).